Mourners at Sanam Luang hold up portraits of His Majesty while they sing the King's Anthem Saturday. 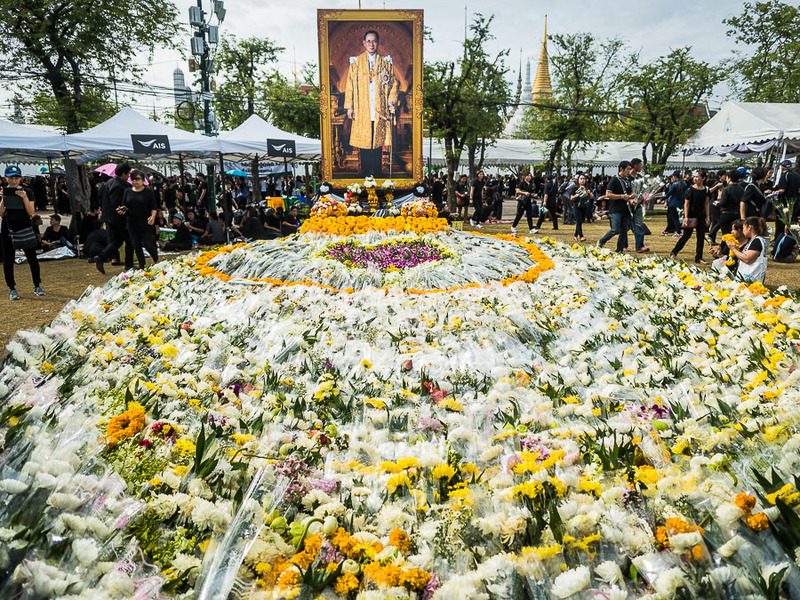 Thais continue to mourn the death of Bhumibol Adulyadej, the King of Thailand, their revered Monarch. There have been large crowds at Sanam Luang, the Royal Ceremonial Ground in front of the Grand Palace. The government has set up a system of shuttles from major transit points in Bangkok down to the area around the palace to make it easier for people to get down there. People pray for the King at one of the shrines set up for His Majesty on Sanam Luang. A sea of flowers left at one of the shrines for the King. There's a sense of community at Sanam Luang for Thais united in grief. People are sleeping at Sanam Luang, Thai community groups are serving free food, the Thai Army and Navy have set up their mobile kitchens to provide food. Rescue groups, hospitals and the Ministry of Health have set up free health care, mostly emergency care for people affected by the oppressive heat but also care for people with other health concerns. Barber schools are providing free hair cuts. Vendors are selling portraits of His Majesty and flowers. Girl Scouts line the walkways fanning people with large pieces of cardboard as they navigate the crowds. It's an astonishing scene. 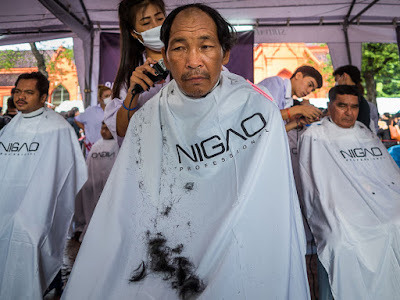 A barber school provides free haircuts. The government has mandated a year long mourning period, the cremation date has not been determined yet but is likely to be at the end of the mourning period. Government employees are supposed to wear black for the entire year (unless they're wearing their uniform, in which case they should display a black arm band or black ribbon). Other Thais, and foreigners who are being respectful, are supposed to wear black for the next 30 days. 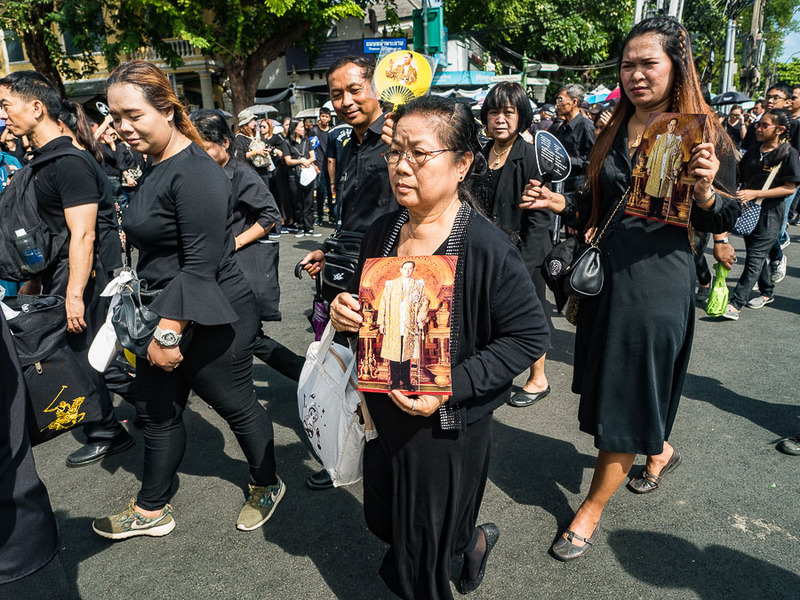 People dressed in black, carrying pictures of His Majesty, walk down the street next to Sanam Luang. 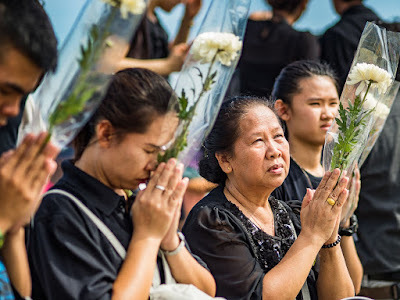 It is not an exaggeration to say that millions of Thais across the country are in mourning. Yesterday, the government said there were more than 150,000 mourners at Sanam Luang. I don't know if that's true. I have been to Sanam Luang for political rallies, holiday events and the King's birthday. In all my years in Thailand I have never seen Sanam Luang as crowded as it was yesterday. It was packed with people in black. The streets around Sanam Luang were packed. 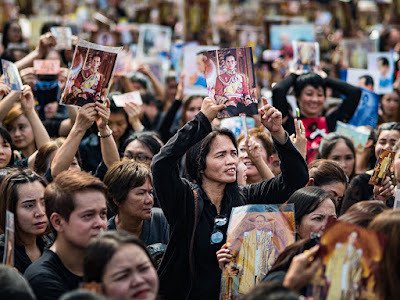 Aerial photos in the Thai media showed that the roads leading to the streets around Sanam Luang were packed with people walking into the ceremonial ground. It was so crowded it was almost impossible to move through the crowd. 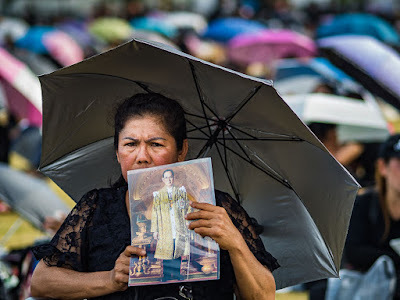 A woman sat under an umbrella with a portrait of the King during one of the rainstorms that passed over Sanam Luang Saturday. This despite oppressive heat and monsoon storms that passed over Bangkok during the day. The King has long been revered as a unifying figure in Thailand's turbulent political history. We are seeing that reverence expressed in big ways and small ways right now.